They say that Saturdays are for sleeping in and Sundays are for seizing the day, so start your morning right with this wild berry fruit salad from top food blogger, Veggieful. It’s simple and tasty, not to mention healthy, and is a great way to embrace all that fruity freshness that spring has to offer. 1. Preheat oven to 200 degrees Celsius and line a tray with baking paper. 2. To make the oat and coconut crumble: Add all crumble ingredients to a bowl. Stir until combined. 3. Spoon out the crumble mixture onto the tray in a single layer. Bake for 10 minutes until browned. 4. Pull out of the oven and allow to sit for 5 minutes until dried and crumbly. Set aside. 5. 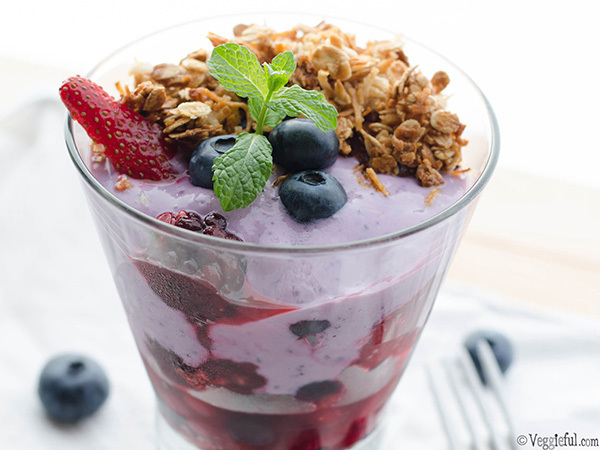 To make blueberry yoghurt: Process all ingredients, including Vitasoy Soy Milky Lite until creamy and smooth. Set aside. 6. For the fruit salad, add all berries to a bowl with the lemon juice and mint leaves. Carefully toss to combine. Set aside. 7. 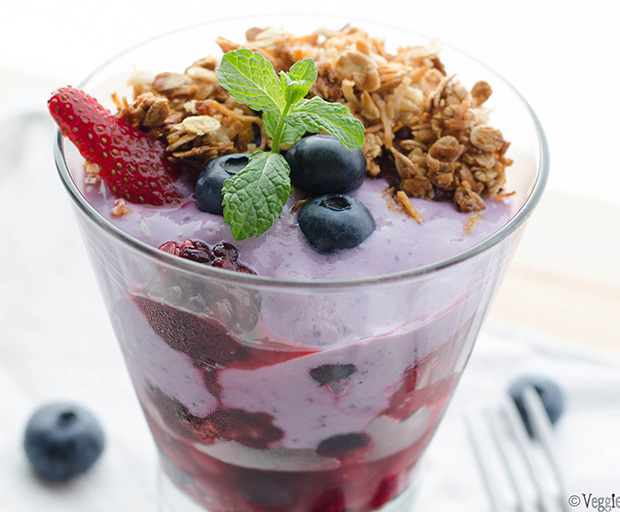 Divide the berry fruit salad between four glasses or bowls, top with 1⁄4 cup blueberry yoghurt and 2 tablespoons of the oat coconut crumble. 8. Serve immediately and garnish with extra blueberries and mint leaves. Tip: You can use agave syrup as a sweetener instead of white sugar if you prefer. Vegans, rejoice! This has to be by far one of most decadent and delicious vegan chocolate pikelets recipes EVER. Created by top food blogger, Veggieful, this breakfast dish is super tasty, easy to make and is the perfect Sunday morning treat to serve up on a chilly morning. Sweet tooth’s, eat your heart out! For the topping: Melt the cocoa, coconut oil and maple syrup and stir until smooth. Set aside. For the pikelet: In a blender (or you can beat it all in a bowl) add all ‘pikelet’ ingredients and blend until smooth without lumps. In a frypan on high heat, spray with oil and drop 2 level tablespoonfuls of the batter mixture into the pan and cook until bubbles appear on the surface. Flip to the other side for another 30 seconds or so until just browned. Set aside. Continue frying until all of the batter is used. 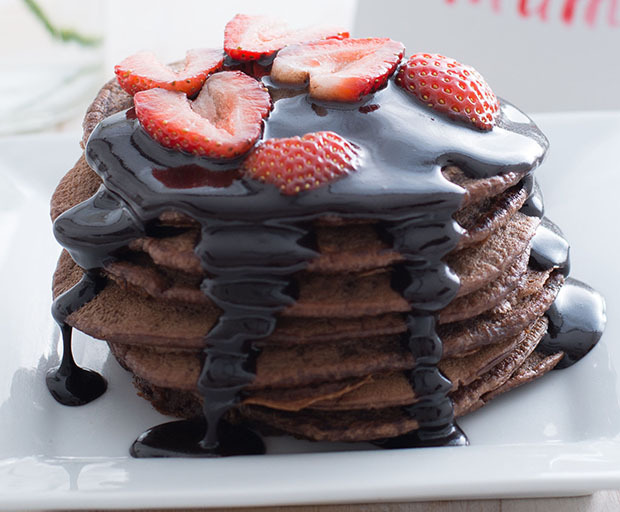 Stack the pikelets and add a light layer of chocolate topping between each layer. Serve with strawberries and enjoy!